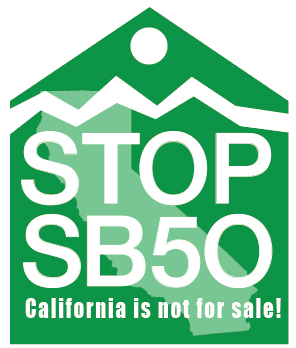 But many people do not yet know that despite a slick PR campaign, SB 50 is worse than SB 827. It will not only fail to reach its goals, but it will instead produce gentrification, traffic congestion, and more Green House Gases. The reason? SB 50 is based on two utterly false premises. Gentrification started with the war on cars. Remember “parking is not a right it is a privilege?” That turned into “cars are evil and parking is the problem”. Now we see the real goal, coming at us, that parking removal soften us up for – citizen displacement. Single family homes are evil. Only multi-family homes, preferably small and confined units, are the “right for all”. If you own a single family home you are a selfish so and so who should sell to the developers and take your supposed profits out of town. Not only is that a strange message to give to homeowners, but it is severely flawed. First, you are assuming because all homes are worth a million dollars, the sellers will be rich when they sell. There are many reasons this is not the case, starting with the fact that many homes are financed and most of the money will go to the banks to pay off the loans. Even for those homeowners who are not sitting on debt, there is the daunting task of moving somewhere else. Where will they move? Why not take the jobs to the housing in the valley to cut out the commute time and commute traffic. The homes are already built and waiting for jobs. Share the wealth of jobs with the communities who need them. Build the office space where it is wanted and needed. Create you new tech-based communities in new cities, without disrupting peoples lives. PALO ALTO, Calif. (KGO) — Ridesharing services are taking a bite out of public transit on the Peninsula and in the South Bay. Ridership is down between four and five percent for both SamTrans and VTA, the Valley Transportation Authority. No one is happy with the current state of our streets and highways and everyone blames someone else. Let’s change the failed system and not worry about why it isn’t working. Public transit agencies need to prioritize moving people where they need to go when they need to get there and drop the emphasis on resigning the streets. For more than a decade the public has given the government a chance to figure out how to manage the streets and plan for a “future better bay area”. Government goals and priorities have been largely focused on re-directing the public, not in serving the public. This has resulted in bad decisions like bus seat and stop removal, that reduced public transit use. Just as the public predicted, they got off the bus. Riders do not trust the system and are fleeing the chaos and violence. What do you expect the results to be when public transportation agencies partner with competing enterprise corporations? Who is benefiting from these partnerships? Instead of hiring lobbyists to force more controls, fines and fees on the citizens they are supposed to serve, public agencies like the SFMTA should hire lobbyists to work on returning the control of the TNCs to the local communities they are effecting. CHANGE THE STATE LAW instead of using it as an excuse for the gridlock they are producing to change the behavior of the people they are supposed to serve. We need to relax the stranglehold the CPUC has on our local governments and stop the state power grab over local jurisdiction. We need a return to local control over local matters. Streets are local and require local control. Public transportation is a local affair and needs local solutions. Remember what life was like before the TNCs? We had a transit system that worked and people with cars were able to take transit when it was convenient without worrying about having to re-park their cars. Taxis were easier to find on the street. There were less cars on the street and traffic moved more smoothly. Reducing lanes and parking has not brought the benefits we were promised. We need to pause and reset our priorities. San Leandro. Antioch. Hayward. Stockton. San Francisco’s Muni operators hail from cities across the Bay Area, in part due to an exploding housing market that’s driven them farther and farther from The City. And with that distance comes long commutes and sleep deprivation. To avoid long hours on the road, Muni operators are increasingly sleeping in their cars on San Francisco streets or in city-operated garages, according to drivers and union officials. Six Muni operators who consistently sleep in their cars while working for Muni spoke to reporters on Monday, alongside representatives of their union, the Transport Workers Union Local 250-A. They were hoping to sound the alarm on the link between low pay, distance to work and lack of sleep. SAN FRANCISCO (KGO) — San Francisco-based companies Uber and Lyft have changed the face of transit here in the Bay Area and around the world. This has happened at the expense of the taxi industry, but many people still believe that taxi cabs have advantages that ridershare cars can’t offer. Namely, the drivers are more familiar with the cities they service which can result in a faster ride and they don’t have surge pricing, so the ride can be cheaper depending on when you take it. Depends on who you ask. Bikers feel safer but the emboldened bikers threaten pedestrians and traffic is worse. Drivers have more problems parking, loading and unloading, double parking. With the demise of many local businesses and a new determination by many to leave the Bay Area soon, further car wars may be a bridge too far for the residents and businesses struggling to survive the highest cost of living in the country. With the highest rate of IPO over-valuation on tech companies that consistently lose money, San Francisco may want to keep some non tech businesses thriving to weather the next economic downturn. We need to conduct some surveys to find out why the businesses are failing. It appears some efforts are already underway in Sacramento to may level the playing field between tech-based contractor-dependent corporations and other businesses. Our heavy dependent on delivery services may also be cut short soon as internet sales taxes, rising shipping costs, and package thefts put a damper on online businesses. San Francisco’s heavy move into sports arenas may be a poor long-term gamble as well. Sports gambling and gaming along with expensive tickets amy not draw the large audiences over the long term. There is a fatigue factor that sets in after a while. SFMTA and City Hall have made a lot of assumptions on how the pubic would act and they have not always been right. Massive traffic jams may dampen tickets sales as they have dampened retail sales. According to the City of Paris, there are 15,000 free-floating vehicles of all forms and shapes in the city, from electric scooters to fluorescent bikes and motorcycle-like scooters. And the City of Paris announced today that companies that operate free-floating services will have to pay a tax depending on the size of their fleet. If the plan goes through and if you’re running a bike-sharing service, you’ll have to pay €20 per bike per year. For scooter companies, they’ll pay €50 per scooter per year. Motorcycle scooters will be taxed €60 per scooter per year. We’re now in Year Seven of the great transportation disruption unleashed on the smartphone-toting world in large part by San Francisco ride-hailing service Lyft. But a federal lawsuit filed Wednesday says that one significant population is still being denied the go anywhere, go anytime benefits bestowed by the company’s service: wheelchair users who need specially equipped vehicles to get to appointments, the airport, dates or work.